Body Posture: Sit in easy pose (or a chair if needed); maintain a straight spine. 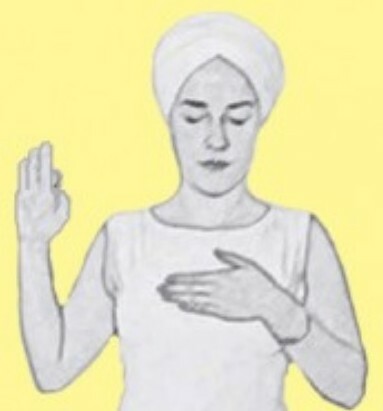 Mudra: Place the left palm over your heart center with four fingers parallel to the ground, pointing right. Place right hand in Gyan Mudra (thumb and index finger press). Raise right hand up with bent elbow as if pledging, three remaining fingers straight up. Time: 3 minutes to begin; build up to 11 minutes (no longer than 31 minutes). Checkpoint: Do not gasp for your next breath. The left hand covers the heart chakra, the natural home of prana (life force energy). The right hand (right side of the body), which is typically active or sun energy is placed in a receptive position of palm facing forward (think of a Papal blessing bestowing peace). The posture (all components) brings about a feeling of calmness, and creates a “still point” for prana at the heart center. HRV Feedback (optional): save HRV session for 40 day trending. Remember to select one meditation that appeals to you for whatever reason. Practice it until to you know it well, and gradually increase it for 11 minutes. Then begin the 40 days of continued practice. If you miss a day, begin the 40 days again.